The transfer deadline has passed, meaning managers must now rely on what they’ve got to achieve their aims this season. TFGSoccerClub picks out those who’ll be most crucial. Astonishingly, Newcastle actually completed some transfer business this January by finally breaking their club record in paying £21m for Miguel Almiron. Whatever the Paraguayan succeeds in bringing – which itself will depend on how long it takes for him to adjust to English football – Salomon Rondon will likely remain the difference between relegation and survival. Rondon may be neither the most technical centre-forward nor the most prolific, but he’s an alpha male of a targetman and purpose-built for the way his side plays. More importantly, among all the forwards playing for sides threatened by relegation, his range of attributes is the broadest. He’s a goal threat who presents an aerial challenge for any centre-half, yes, but his ability to build moves and establish a footing in an opponent’s half is ever invaluable. Increasingly so, perhaps, because Almiron’s close control and ability to beat defenders should diversify Newcastle’s threat and make Rondon’s pivoting all the more productive. One of the key differences between Liverpool and Manchester City is obviously depth, and that’s one of the reasons why the gap between the two isn’t insurmountable. Five points is a significant advantage, but City being as gifted as they are makes it feel more slender. But perhaps it’s actually Liverpool who possess the most effective gear change of the two? Shaqiri is a flawed player – there’s a reason why he typically works from the bench – but he’s so aggressive when in possession that at some point, perhaps in a deadlocked game against a deep-lying side, he will surely be the difference between one point and three. With a long shot, perhaps, or a cutting, low-percentage pass. He’s inconsistent, but he wasn’t bought for the purpose of providing continuous production. Invertedly, his value instead lies in the kind of self-indulgence which makes him so different to Klopp’s other attacking players. Shaqiri did it against Manchester United earlier in the season, and as the pressure increases on Liverpool and the Champions League resumes, he will surely grow in importance. Well, obviously. A side issue here is that, while Higuain’s arrival at Chelsea solves one of Maurizio Sarri’s biggest issues, it’s still baffling that the Italian hasn’t placed more faith in Olivier Giroud. Nevertheless, Higuain is the better fit for Sarri’s style, purely by virtue of being a superior footballer. It’s important that he scores goals, clearly, but equally that he’s comfortable receiving the ball in a multitude of positions and willing to drive forward with it rather than just lay it off. He’s more aggressive, and given how passive Chelsea are at the moment – and what an obstacle that is to their hopes of qualifying for the Champions League – it’s a precious quality at the moment. Manchester City’s Fernandinho (left) and Wolverhampton Wanderers’ Diogo Jota battle for the ball during the Premier League match at the Etihad Stadium, Manchester. The tenets of Wolves’ success are well established: the stable back three, the international goalkeeper, the raiding wing-backs, and that pair of classy ball-players in central midfield. Much of their progress to this point has, and will continue to be underwritten by that core group. But in Jota they have a less orthodox player; not quite a midfielder, not quite a forward. But from being on the first team’s fringes earlier in the season, he and that slightly ethereal style of play of his have grown steadily more influential. Ruben Neves and Joao Moutinho bring control and rhythm, but it’s Jota who provides the real thrust with his vertical movement and attacking punch. If Wolves are to finish in the European places, then his fingerprints will be on that achievement too. He’s a supplement to the side, really more decoration than key component, but teams who overlook his threat will continue to be punished. Liverpool’s Mohamed Salah (left) celebrates scoring his side’s third goal of the game with team-mate Virgil van Dijk during the Premier League match at Anfield, Liverpool. Liverpool are now protecting a position in the league, and with that comes a very specific pressure. 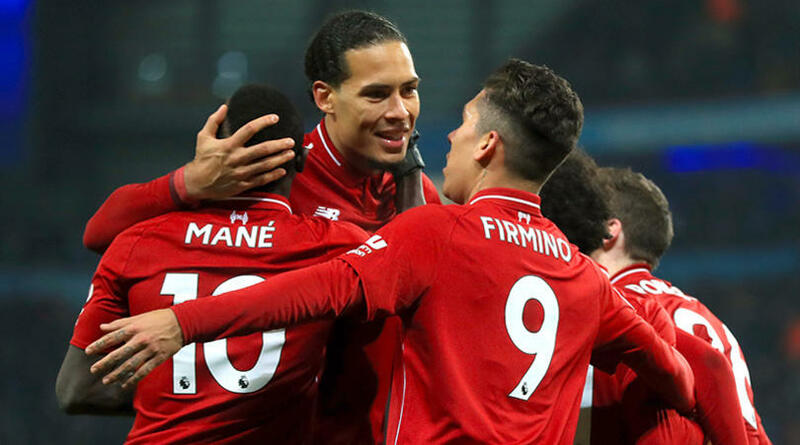 Between now and May, Jurgen Klopp’s forward line will have to continue scoring goals in the same volumes, but at some point the situation’s weight will begin to bear down on this team. When that moment arrives, the focus will inevitably fall on their defence – particularly in February and March, when they’ll travel to Old Trafford and Goodison Park to face opponents desperate to put an axe through their season. At the end of the month, Tottenham will visit Anfield and, by that point, should have their full array of attacking options available. Winning titles is difficult, and rarely as easy as Manchester City made it look last season. Trouble will find Liverpool eventually and, when it does, it will be to Van Dijk that they look to help maintain the defensive security, organisation and composure which has brought them this far. As a further measure of his importance, it’s not hyperbole to claim that if he was to suffer even a semi-serious injury which kept him out for any length of time, City would almost immediately become favourites to win a second successive championship. Should he even be in Chelsea’s team at the moment? That’s irrelevant, because for as long as Maurizio Sarri remains their manager, Jorginho will be starting at the base of midfield. Sarri is notoriously stubborn, so don’t expect any concessions. Which means, of course, that he has a problem which needs fixing. The secret is out on Jorginho and it’s not a coincidence that every opposing manager who has scored a notable victory over Chelsea this season has built their gameplan around nullifying the midfielder with a man-marking strategy. Tottenham did it, Arsenal did too and, most recently, Eddie Howe’s Bournemouth copied a formula which has been proven to work: restrict Jorginho’s passing avenues, pressure him on the ball, and Sarri’s side become slow-paced and vulnerable. There are other problems, but this one in particular needs a cure. Liverpool and Manchester City are too far in the distance to be caught and Tottenham might also be. But if Chelsea are to secure the final Champions League place and beat off the challenge of Arsenal and Manchester United, Sarri needs this part of his side to function much, much better. He’s made his bed with Jorginho, now he must lie in it. Referee Jonathan Moss speaks to Cardiff City’s Callum Paterson during the Premier League match at the Cardiff City Stadium, Cardiff. A fascinatingly adaptable player who, just this season, has already played as a centre-forward, midfielder, wide-midfielder and a full-back for Neil Warnock. He’s been effective, too, and while he has no particular attribute which will be crucial in determining whether Cardiff survive, the spirit he embodies – the ruggedness, the character, the willingness to rage against the Premier League’s inequalities – will be essential. Those may sound like wooly intangibles, but watch the way he plays the game and admire his infectious enthusiasm. And that’s particularly important now. The Emiliano Sala tragedy is not a footballing story and obviously shouldn’t be viewed through that prism, but the effect on Cardiff’s dressing room must have been devastating. There’s no precedent for how to cope with such a situation and, given the distressing dynamics, there are several Bluebirds employees who deserve to be saluted for the composure with which they’ve coped. On the pitch, though, Paterson is now vital. As a player who seems to embody so much of the joy in playing professional football, he has a key role to play in these darkest of times. Qatar won some north London hearts with their defeat of South Korea in the Asian Cup, as their victory sent Son back to Tottenham well ahead of schedule. No sooner had he stepped off the plane back to England, he was showing just how timely his return was, providing a jaded Spurs with some much-needed energy in their come-from-behind win over Watford. And he’ll have to be their talisman for many more weeks. The injuries to Harry Kane and Dele Alli will keep the pair out until at least March, and if Mauricio Pochettino isn’t able to hide their absence, his team’s season could well be over by the time they return to action. The value of Son, then, beyond his obvious attributes, is the range of positions he’s able to cover. He is neither Kane nor Alli, bearing no stylistic comparison to either, but his goalscoring, pace and ability to go past defenders provides a different sort of threat which should be enough to keep his club inside both the top four and Champions League over the next six weeks. Fulham manager Claudio Ranieri speaks to Fulham’s Calum Chambers during the Premier League match at Craven Cottage, London. A case could certainly be made for saying that Aleksandar Mitrovic will determine whether Fulham have a Premier League future; either he scores goals or they go down. But the greatest degree of improvement must come in defence and if – if – Claudio Ranieri was to toughen that area, his side’s chances of survival would multiply. Chambers is key to that. Despite the last-minute arrival of Havard Nordtveit on loan, it can be assumed that the back three, irrespective of the players selected, is going to remain fragile. That means Chambers’ role is vital. He’s actually been a great success since being reassigned to midfield, and the combination of his natural centre-half instincts and technical ability has made Fulham a tougher proposition. And that will have to continue to be the case. Fulham must cure a whole range of problems between now and May – their goalkeeping has been poor, neither Luciano Vietto nor Andre Schurrle has had the expected impact, and Jean-Michael Seri must start to consistently live up to his billing. But Chambers is an important foundation block upon which those improvements can be built. Manchester City’s inactivity in the transfer window was a surprise. Their squad doesn’t exactly lack depth, but the anchoring midfield position, from which so many moves begin, remains worryingly under-staffed and the burden on Fernandinho isn’t getting any lighter. In February alone, City will face Chelsea twice, Arsenal and Everton, and recommence their Champions League efforts against Schalke. With such a concentration of fixtures, one has to wonder just how well a 33-year-old midfielder is likely to cope. More importantly, what would happen to City’s challenge – in both competitions – if he was to succumb to injury or suffer a sustained bout of poor form? There are no alternatives. Fabian Delph is passable in that role but clearly not in the same weight class, so any fluctuation in Fernandinho’s performance could create a critical flaw. It’s a bizarre situation. City have tremendous depth in so many positions, but in the role which is perhaps most pivotal they remain solely reliant on a single, ageing player.